Why would we ever need to give up gravy to begin with you ask? And what about those little envelopes of gravy mix in the store? Can’t we just use those? I use to think the exact same thing when I first became Vegan, but have you ever looked at the ingredients in one of those little packets? Definitely not Vegan, and definitely NOT healthy either. 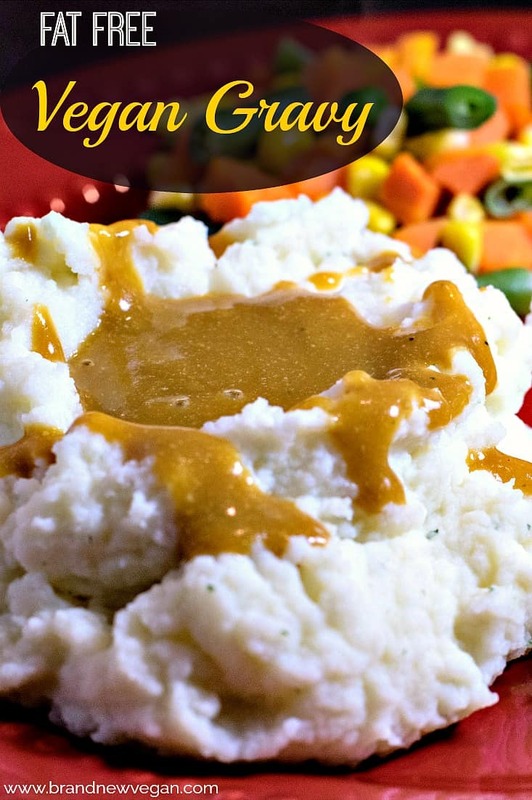 No worries, there IS a way to get your gravy fix, it only uses a few ingredients, it’s fat free, and it literally takes just minutes to whip up a batch. 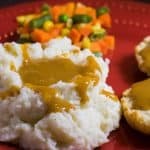 Let me show you how to make some of the BEST Vegan Gravy you ever tasted! This is one of the easiest recipes ever – I promise. Add ¼ cup of Whole Wheat Flour, 2 heaping tablespoons of Nutritional Yeast, 1 tsp onion powder, ½ tsp garlic powder, and ½ tsp black pepper to a small saucepan. Whisk the dry ingredients together over med-low heat until they become toasty, no more than a few minutes. Slowly add the veggie broth and whisk to remove any clumps. Now add the soy sauce, mustard, and the optional kitchen bouquet and stir to combine. Kitchen Bouquet is a browning sauce that you can find in your grocery next to the A1 and Worcestershire Sauce. It’s completely optional – but it does help add a bit of color to the gravy, however, it will not affect the flavor at all if you decide to leave it out. Continue stirring over med-low heat until it’s bubbly and thickened. That’s it! See I told you this was easy? Now go pour this amazing gravy over your mashed potatoes, biscuits, or anything else you can think of. I’m having this over mashed potatoes right now– yum! It tastes like a beef gravy. I love that it is fat-free! Thank you! Best gravy ever! I’m finding excuses to pour it over anything and everything. I’m pretty sure worcestershire sauce isn’t vegan. Unless you are specifically using a vegan brand such as Annies. Which of course you probably are. A lot of dollar store brands don’t have anchovies in their Worcestershire sauce. This is an excellent gravy recipe. I steamed up some mushrooms and onions before making it and added them to the gravy. Good stuff. Don’t say that! I always thought I was a terrible cook, but then I realized it was because I needed practice and that not every recipe is perfect for your preferred flavor profile. Now when I make something new, I go by the recipe as exactly as I can, then I ask my family, what did you like, what didn’t you like, and how could I change it to make it better for us. I find it takes 2-3 times to really get it right for me. What a no oil great recipe! Definitely trying that one. We always make our gravy brown by gently browning the dry flour in the bottom of the saucepan, then adding the other ingredients. OMG I can’t believe how good this actually is! 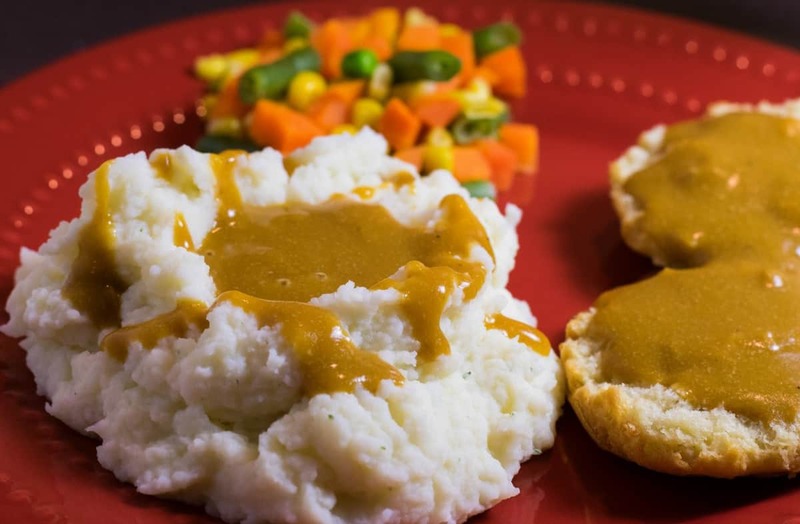 I’ve been experimenting with vegan stuff and wanted to give this a try since Easter dinner is coming up and I love mashed potatoes and gravy. I have to admit I didn’t have too high hopes. So, I was pretty surprised at how thick it got and how perfect tasting it was! I’m bringing this to Easter dinner and I guarantee no one will have any idea it’s vegan. I literally want to spoonfill my mouth with it! Excuse my ignorance but how do you “toast” dry ingredients? Place the flour in a pan and heat until it smells like toast…. What flour would you recommend as a sub for wheat if you wanted it gluten free? I used brown rice flour, and it turned out great! And it tastes good with the rice flour? I am gluten free and would like to try! I made this recipe tonight. The only thing I change was using 1/4 tsp black pepper rather than 1/2 tsp. I love it! My husband says this gravy is THE BEST! Thank you! It is so easy too! I made this just a few minutes ago. It is REALLY GOOD!! I added a few fresh herbs, sage, thyme, rosemary, and a pinch of Mrs Dash no-salt seasoning, plus a few slices of portobello mushroom, chopped finely. And, since I had no veggie broth, I used the water I cooked my green beans in, and more plain water. It was excellent. 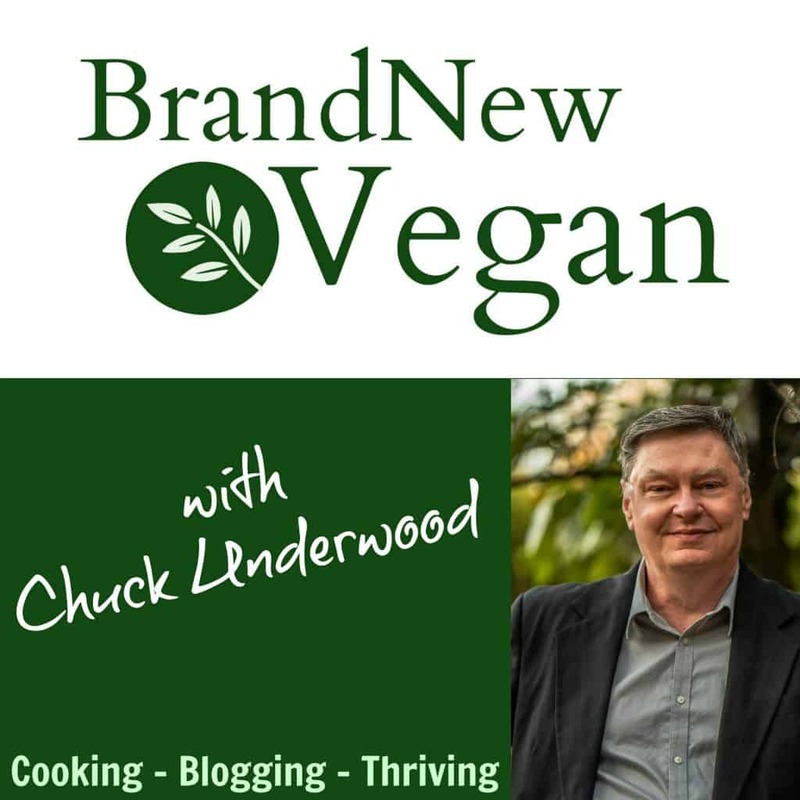 I’m a retired chef, and very critical, but I would recommend this to anyone, vegan or SAD! Great job, Chuck! I love this recipe and it has become a family favorite! The only thing I changed is the amount of pepper (the first time I made it I had to throw it out and make it again because there was to much pepper) and also once I toast the dry ingredients I put all the ingredients in a blender and blend it and then put it back on the stove to thicken..the texture is SO MUCH BETTER! I agree to the blending, then stove to thicken. I did whisk the heck out of the mixture and still had bunches of tiny lumps. So into the Vitamix it went. Any suggestions how to avoid the lumps? Add the flour to the cold vegetable broth before adding to the hot ingredients. The heat will make tiny dumplings (lumps) otherwise. I get Kikkoman Less Sodium Soy Sauce, and it does NOT have MSG in it! I get Kikkoman Less Sodium Soy Sauce, and it IS indeed Vegan! Is this prepared yellow mustard or dry mustard powder? Thanks! If you’re that worried about the soy sauce use liquid aminos by Bragg. I might marry this gravy. My meat eating husband even likes it and may I add he doesn’t even like gravy that much; doesn’t eat it at Thanksgiving for example. But he likes this. I make it without tamari, mustard or kitchen bouquet. I use about 1/4 tsp of dried rosemary, and sprinkle some salt on top of my food since I skipped the tamari. As others noted, it was difficult to get smooth by adding liquid to the hot ingredients. I put the flour and liquid in my bullet blender till smooth, then return to the pan. Perfect! Best texture ever. This gravy is awesome but I need nutritional yeast not fortified with B vitamins. I am super sensitive to the niacin flush and Bob’s Red Mill Nutritional Yeast has way more niacin than I can handle – I am hot and itchy for hours after each time I eat it. I cut out the nutritional yeast and no more hot and itchy flashes but it is not quite as good. Try Foods Alive Non-Fortified Nutritional Yeast availability online from Vitacost. Was just as good as you said. I’m taking it to thanksgiving Thursday!!! Dude, you aren’t wrong with that name. I’m not a big gravy fan, but this is AMAZING. Once again fantastic as usual. However, I can’t make it without putting it in the vitamix to get out the lumps. What am I doing wrong? Is the broth supposed to be hot or cold? Cold both….I toast the flour, nooch, and spices for a minute or so and then pour in the cold broth…whisk. Never had a problem with lumps. I have to tell you…I made this for Thanksgiving dinner with my omnivorous family. It was SOOO good, I literally walked around the house and gave a spoonful to just about everyone there. Without exception, they said it tasted Just Like roast beef or venison gravy. Absolutely perfect. I have used many of your recipes, some with my own tweaks of course, and will continue to do so. Thank you So Very Much, Chuck! Love this gravy! Thank you as I’d been missing gravy or sometimes having the old greasy meat type. This is soo much better, no greasy feeling afterwards but with all the flavour. Thank you! 3-5 days should be fine. This gravy is life changing and absolutely wonderful!!! I have made it several times now and I just love it! Thank you so much! Keep up the great work my friend. Wow! Absolutely amazing recipe! Been a converted meat head for about 4 months and this really hit the spot. Thanks for the amazing recipes! I’m assuming this makes more than one serving. Anyone got any ideas how to extend its life beyond 3-5 days? Haven’t tried it yet . . . so no rating. Made this tonight and poured over my baked potato and it was delicious. . So good I’m going to put it on my hash browns in the morning. This is the best gravy I have ever had. Seriously. It may end up being my dietary downfall. So good! You weren’t kidding when you said this was the best gravy. It really is. Thanks for every Chuck! Ok- this gravy is really, really delicious! I just made it with some homemade mashed potatoes and it was amazing! I made my own brown rice flour because I didn’t have whole wheat but the gravy cake oit womderfully. Thank you for sharing such a gem! Yum! Way Better Than I Expected! I Subbed The Whoke Wheat Flour For Unbleached I Had On Hand & Added Carmalized Onions. I made this for the first time over the weekend. Amazing! Delicious! My non-vegan husband just kept talking about how good it is! Found it a little too stong with the mustard taste and it was a bit “tangy” so i addes some lemon juice to cut down on the tangy taste. Workes great! I will admit I was skeptical, making a gravy without butter, but so good. I did however deviate. I used potato water to mix with my boullion, I used Marmite (it was all I had) and I added a teaspoon of poultry seasoning. I’n So excited to have found a fat free gravy. I’ve made this and is great, but today I only have whole wheat pastry flour. Any idea if that will work? Hi. I want to try this recipe tonight, I only have iat flour & garbanzo bean flour on hand. Will either of these wirk? I think so – many people have made this gluten free. Can this be frozen? Thanks. Mine turned out gritty I think from the onion powder and garlic powder. Any recommendations on how to fix that for next time? I’ve never heard that one before. No idea. Try using an immersion blender (or a regular blender) to blend all the ingredients up before heating it. Genuinely the best gravy I’ve ever had. This is great. I used brown rice flour, only 1 TBsp of liquid aminos and 1 tsp of Better Than Bouillon organic vegetable, and no Kitchen Bouquet. Really has an authentic (beefy?) flavor. This is better than the other gravy I was making. No amino flavoring at all and no fat. This is the best gravy EVER. I use on top of everything for a wonderful sauce. I first made it with chicken fried tofu and mashed potatoes and then added it to crispy, oven baked, fate free French fries. The possibilities are endless and so is the flavour. Just made a double batch to use in my Shepardless Pie. OMG is it ever good! I had a bowl of my cauliflower/potato mashies with gravy over it for my lunch! Pie is for supper. Can’t wait!! !